To a lot of us, First Thursday means avoid the Pearl District. But what if instead of a possible glass of wine and some grapes and cheese at stodgy art galleries, you could get a specialty cocktails at a multitude of bars? Wouldn’t that make First Thursday fun? We are in luck! The First Thursday Pearl District Bar Crawl, a benefit for ALSO (the Association of Liquor Store Agents), takes place this Thursday, June 3rd. Organized by the Oregon Distiller’s Guild and the Oregon Bartender’s Guild, each participating venue features a specialty cocktail. (Of the fourteen venues participating, two are Downtown, one is in Old Town, and there’s a hotel and a grocery store, so the event should be called the First Thursday Downtown, Old Town, and Pearl District Bar, Grocery Store, and Hotel Crawl, but I won’t nitpick any more than what I just did). You’ll find a map below (click it to download the full-sized pdf). 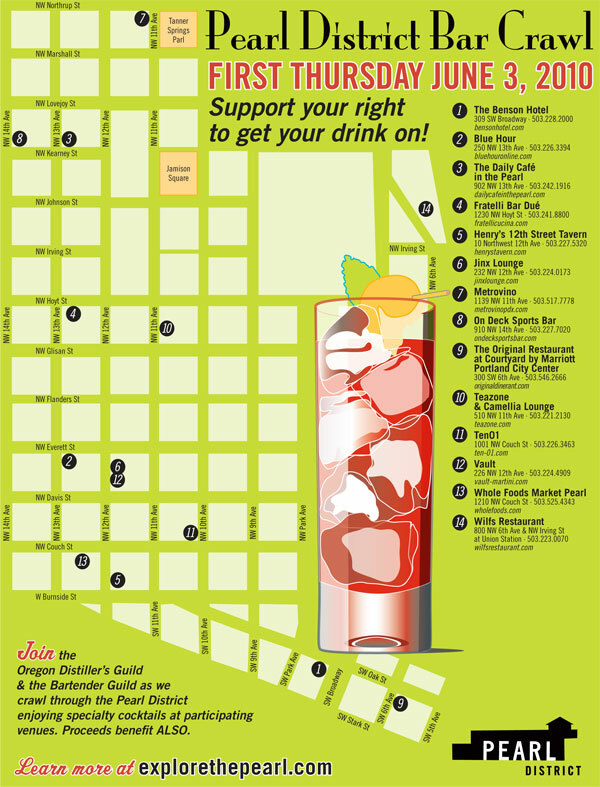 Visit the Oregon Bartender’s Guild website, or the New Deal Distillery June 2010 events page for more info!